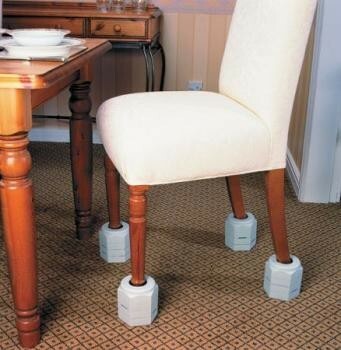 Cleverly designed raisers that can be adjusted in height and are suitable for either round or square legs. The rubber flanges within each raiser lock them in place around the chair leg, which enables the furniture to be moved without the raisers falling off. Langham Grip-On Raisers...Cleverly designed raisers that can be adjusted in height and are suitable for either round or square legs. The rubber flanges within each raiser lock them in place around the chair leg, which enables the furniture to be moved without the raisers falling off. Raise 25mm (1"), 50mm (2") and 75mm (3"). Available in three sizes to fit chair or bed leg measurements.Maximum Total Load: 78 Stone (500 kg).